You’ll see a ‘Working facia’ overview of screen, keyboard and touchpad, a gaming FPS test, am overview of the Toshiba Z830 and Asus UX31, a boot speed test, some good detail about the heat and Turbo Boost capabilities and tons more. I’ll be writing some more information up over the next few days. You’ll also see a full review of the Acer S3, the Toshiba Z830 and, if I have time before I break for the holidays, the ASUS UX31 which is likely to be my final choice as a personal Ultrabook for my CES coverage in Jan. I had a test with both Zenbook laptops Today at the Microsoft Store and here are my thoughts on the machine. The Screen looks good with decent brightness and contrast head on viewing is good but the viewing angles are poor by comparison to the Series 9 and Thinkpad x1. The Keyboard is one of the worst I have used in a long time the keyboard is simply shallow to type on for long periods of time, the keyboard on the series 9 is the same keyboard found in my HP netbook it works fairly well, and Thinkpad x1 has the best keyboard of any I haves used so far. 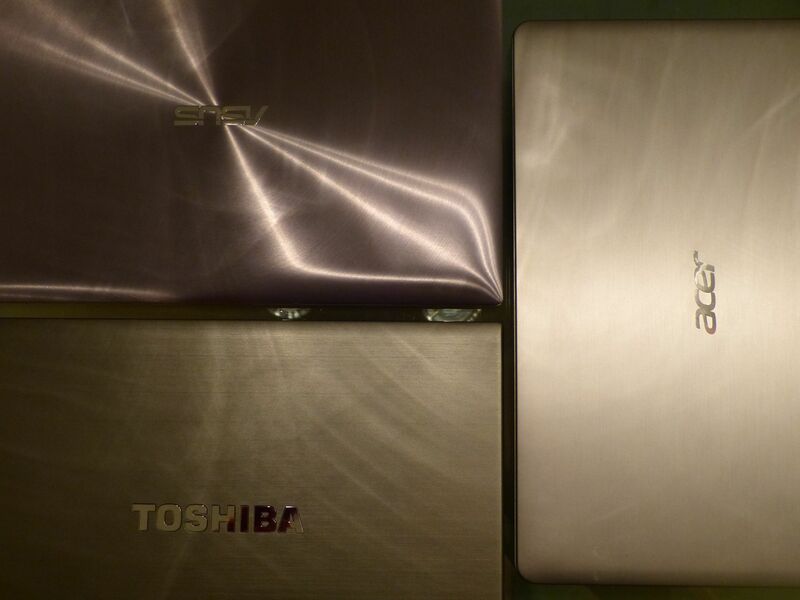 The spun metal finish looks kinda cool but Asus flat out ripped of the design from the Macbook air everything from the teardrop shape, the trackpad, etc and frankly I don’t want to spend upwards of 1000 US dollars on a fancy knockoff product. Don’t mean to hate just giving my opinion. Plus I can get the Series 9 for 900-1000 us dollars or less at this point. Also Chippy are you ever going to review the Thinkpad x1 despite not being an ultrabook it seems to fit the Intel specification. Great videos Chippy, thank you for all the work and information you supply us! I can’t wait for you to get a U300s review model, you will love it! The overall design and build quality is just so awesome, and the keyboard is an absolute pleasure to type on. As for the UX31, I just can’t get over that awkward power button placement! I hit DEL without looking all the time! Dan. If there’s anything I can do to incentivise you to write a review for us, please let me know. It’s important for me, for Ultrabooknews and of course, all the readers. In short: How much does your time cost ?! Hey Chip! First of all, many thanks for the professionally performed live stream test session! I have a question regarding the SSD in the UX models. There is no doubt that the A-Data SSD recieves much better WEI scores (7.9!) than the Sandisc version (5.9). Can I as a potential buyer by any means know what actual SDD is in the computer before I buy it? On notebookreview.com, they mentioned that the AData version has a Sandforce sticker on the box whereas the Sandisk version does not. If it’s a 256GB version, it will probably have a Sandisk drive. I don’t know if Intel is underwriting, but when introducing the new MBA Steve Jobs said something to the effect “I believe that 1 day all computers will look like this”. That leads me to believe that Intel is the main initiative behind the MBA/Ultrabook movement. So I HIGHLY doubt Asus will face any legal threat over the ZenBook. That’s exactly what I think. You don’t design a ground-breaking laptop without input from the people that designed the CPU. The thermals, which defined the size of the MBA, must have been a joint project. Maybe there’s even some patents around that Intel own! Intel have been public in saying the Apple drives them so it’s likely they worked on this together during the UMPC years when low-power, small-size and mobility became important and possible. « Samsung Galaxy Nexus Officially for Sale in the US, Finally!